Coarsely grate the Queso Fresco or other cheese. Wash and dice the nectarines, discarding the pits. Heat a griddle or pan to medium and lightly grease it. Place the tortilla on the griddle and cover it with a layer of queso fresco. Sprinkle some of the diced nectarines over half of it. If desired, add a sprinkle of chopped cilantro. When the cheese is melted, fold in half and remove from heat. 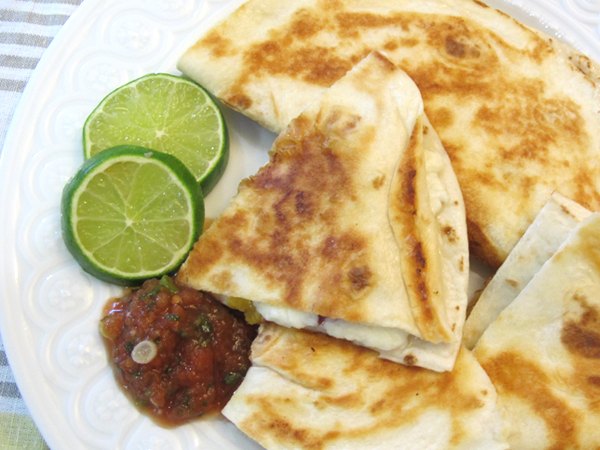 Cut it into wedges and serve immediately with a side of salsa and lime wedges.